Published: Dec. 31, 2012 at 06:53 p.m. Updated: Jan. 1, 2013 at 12:57 p.m.
Black Monday arrived, and it brought a lot of change and bad news for many coaches and general managers around the NFL. We covered all the news on Around the League, but this page is a one-stop shop for links to all the latest news. Arizona Cardinals: Coach Ken Whisenhunt and general manager Rod Graves are out, a team source told NFL.com's Ian Rapoport. The Cardinals later confirmed the moves. Buffalo Bills: Coach Chan Gailey was let go after three seasons that went nowhere in Buffalo. The defense and quarterback play never improved. 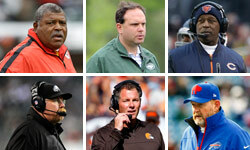 A team source told NFL.com's Albert Breer on Tuesday that Buddy Nix will be back as the Bills' general manager, however. 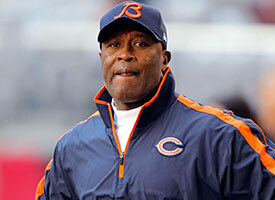 Chicago Bears: In the first mild surprise of the day, coach Lovie Smith was fired after three playoff appearances in nine years, NFL.com's Ian Rapoport first reported. General manager Phil Emery took the job last year and will hire his own man. Cleveland Browns: The team announced Monday morning that coach Pat Shurmur and GM Tom Heckert both are out. They never had much of a chance once new owner Jimmy Haslam bought the team. Kansas City Chiefs: Chairman and CEO Clark Hunt announced the Chiefs have parted ways with coach Romeo Crennel. The team said it has not made a final decision about GM Scott Pioli's status. NFL.com's Steve Wyche reported Sunday that the Chiefs are expected to retain Pioli despite a disastrous 2-14 season. Philadelphia Eagles: Owner Jeffrey Lurie confirmed Monday morning that coach Andy Reid is out after 14 seasons in Philadelphia. The Eagles won't waste any time starting a coaching search. San Diego Chargers: The Chargers announced both coach Norv Turner and general manager A.J. Smith will not return. Former Green Bay Packers GM Ron Wolf has been brought in as a consultant to help search for the next leadership group. Carolina Panthers: Ron Rivera has struggled to win close games during his tenure and isn't a natural in game management. A four-game winning streak to end the season could save his job, but the Panthers will hire a new GM after the season. Chances of a change: Strong. NFL Network's Michael Lombardi reported Sunday that Rivera likely will lose his job, although the next GM will decide the coach's fate. Take a look at the coaches and GMs who have been relieved of their duties following the 2012 regular season. Detroit Lions: Jim Schwartz and GM Martin Mayhew pulled off one of the best rebuilding efforts of all time after taking over the 0-16 Lions. And then the bottom fell out for a talented roster this year. Chances of a change: Diminishing. Multiple outlets said earlier in the week that Schwartz was safe, but ESPN reported Sunday that Lions ownership is so disturbed with the team's culture, it could make a change. Three offensive assistants reportedly were fired Monday. That's a strong sign Schwartz will remain. You usually don't let a coach fire assistants if he's on his way out. Jacksonville Jaguars: Mike Mularkey was hired just last year, but his boss, GM Gene Smith, was fired Monday morning. Mularkey wasn't able to develop young quarterback Blaine Gabbert. Chances of a change: Good. Mularkey told players in a team meeting that he's still the head coach after talking with the owner Thursday and Monday, Fox Sports insider and NFL Network contributor Jay Glazer reported. But Mularkey's fate ultimately will be decided by the next GM. Mularkey will have to wait and see. Dallas Cowboys: Cowboys owner Jerry Jones intimated throughout the process that he hasn't even thought about changing head coaches. Fox Sports insider and NFL Network contributor Jay Glazer first reported that coach Jason Garrett was safe two weeks ago. NFL.com's Ian Rapoport reports that Garrett could be asked to hire an offensive coordinator that calls plays. New York Jets: The Jets announced that GM Mike Tannenbaum was let go Monday morning. But they also announced Rex Ryan will stay on as coach. It's an awkward arrangement for whomever the Jets hire to run the personnel department. Tennessee Titans: The Tennessean reported Monday that coach Mike Munchak will keep his job despite a 6-10 record. Personnel executive Mike Reinfeldt is out, though.